What a great place! Door County Candle Company (formerly known as Candleworks of Door County) is a unique shop in Door County that manufacturers all their own candles right on the premises, allows folks to come in and dip candles too, and offers factory direct savings because there is no middleman! 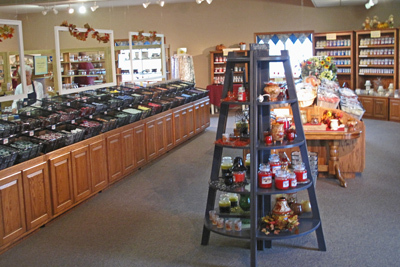 Jar candles, votives, chips – you name it, they make it, all right here in Door County! Mike Felhofer, the owner along with his wife Tonya, grew up in Door County and has been in the candle business since 1994, had a previous candle business which he sold in 199, and opened Candleworks in 2003. This wonderful shop has fabulous candles and accessories, like you will see nowhere else in Door County, and Mike likes to add "It's a unique shopping experience in the whole Midwest." Mike told us that "this is a fun job; I get to make wonderful candles in Door County, and meet great folks every day." The shop has shelves and shelves of candles on display, along with great accessories, and you can even see the candle makers at work in the back section of the shop - all open for your viewing pleasure. Shoppers feel at home amidst 48 different scents, which include seasonal fragrances like their signature fragrance, Christmas Spirit, or Fall Harvest. We found this to be a huge help in finding exactly what will please you. In fact, Mike relayed to us that customers tell him on a daily basis how enjoyable the store is in terms of display, quality, the use of space and how big the shop is, and the expert and friendly staff which is always there to lend you a helping hand. I watched Mike help at least 5 shoppers while we chatted about the shop for this review – he is there to help too! It truly is an enjoyable and engaging atmosphere, and we know the candles are priced right too because they do indeed make them here and so offer these high quality candles at prices below any other similar candles you may happen to find somewhere else. We know how great these candles are, because we have owned some of these Door County Candle Company candles for years, and as we write this review, Spring Breeze (which I love year-round) sits atop my mantle filling the room with a wonderful, happy fragrance! When autumn is in the air, so too will be Pumpkin Pie, my fall favorite, which is a spicy blend of pumpkin, cinnamon and clove – wonderful! You have a huge section of jar candles, as well as scented wax chips to put in melting pots, votives, tapered candles and more. On their website, all the candles are available for purchase. Mike told us the latest two scents are Toasted Coconut and Fall Harvest. Wow – this place is a perfect place for purchasing your own fabulous candles and accessories, or for that special gift for someone. A staggering array of accessories is available in the Candleworks shop, from wick trimmers to candlesticks in glass and metal to a huge assortment of decorative cylinders and more. Let me explain what I mean. The jar candles come with the standard Door County Candle Company label, glass jar and lid. Perfectly fine as is. Want to fancy it up a bit? Wow – can you ever in this great shop! Cylinders are decorated glass tubes, about 6 -7 inches in diameter, that you lower to surround the jar candle for a cozy, unique and inspiring look, as the flame shines through the decorative glass. These cylinders can be seasonal favorites for fall or the holidays, or more generic decorated cylinders. There are centerpiece accessories, votive cups, pillar holders for the jar candles, a variety of melting pots (either electric or heated by teal light) to melt the scented chips available, beads, plates, unique shades that fit on the candle jars (ala a lamp shade) and a whole lot more! And you can dip your own candles as well. Next time you are coming to Door County, be sure to make the Door County Candle Co. a stop – in Carlsville (between Sturgeon Bay and Egg Harbor), in the Carlsville Marketplace (which also houses Door County Coffee & Tea, Pet Expressions/the Door County General Store) on the west side of highway 42. Open on weekends in winter too! And please tell Mike and the staff that DoorCountyNavigator.com sent you - that helps keep this site alive & well for you! Thanks!